Geoconservation is the recognition, protection and management of sites and landscapes that are important for their rocks, fossils, minerals, or other geological or geomorphological features of interest. The Society recognises the importance of Scotland’s geodiversity as an integral and vital part of our environment, economy, heritage and future sustainable development, to be safeguarded and managed appropriately for this and future generations. We commit to maintain and enhance our geodiversity, and are founding signatories of Scotland’s Geodiversity Charter. Local geoconservation groups work with local authorities and other partners to promote geoconservation in their areas. These groups identify Local Geodiversity Sites – the most important places for geology, geomorphology and soils outside statutorily protected areas. Local groups work to raise awareness of sites and geodiversity through publications, interpretation boards and events, and by developing access and educational usage of sites and trails. Local Geodiversity Sites are the most important places for geology, geomorphology and soils outside statutorily protected nature reserves and Sites of Special Scientific Interest (SSSI). The designation of Local Geodiversity Sites is one way of recognising and protecting important earth science and landscape features for future generations to enjoy. 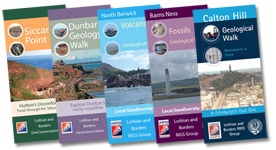 We also work to raise awareness of sites and geodiversity through publicity such as leaflets, booklets, posters, interpretation boards and the Internet, and by developing access and educational usage of sites and trails (Local Geodiversity Sites were previously known as RIGS, Regionally Important Geological and Geomorphological Sites). Click here for the Lothian and Borders Geodiversity sites page.